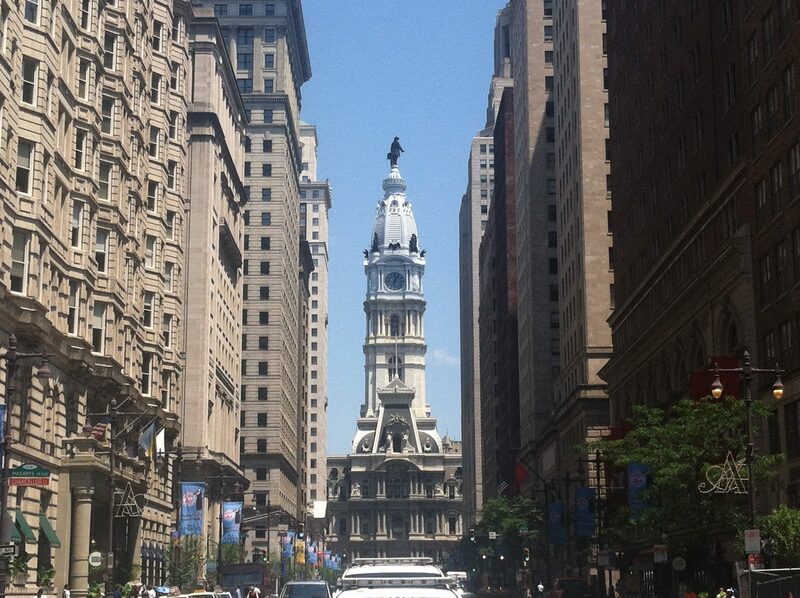 At the heart of the city lies City Hall, a monumental structure that dominates Penn Square. It is at the intersection of Broad and Market, the two most major roads in the inner city. From Broad Street, the imposing bell tower can be seen for miles down the road, as well as from around the city. When it was completed in 1901, it was the tallest building in the world at 537 feet, the first building to surpass Europe’s cathedrals. A massive statue of William Penn stands on top of the tower, which is the tallest statue to top a building in the world. The courtyard in the center of the building can be accessed almost any time, and from every direction. There is a compass in the center, a reminder that Broad Street is actually not on a north-south axis. There are often musicians playing here, which can add to the effect. The tour of City Hall happens only once a day, at 12:30. It is a very lengthy tour, but very well worth it. The tour begins with a basic introduction to the life of William Penn, and how he acquired the land that Center City is on today. The tour continues around the courtyard, pointing out a variety of statues, and the immense symbolism behind them. Also included is information on Alexander Calder (not to be confused with the other Alexander Calder), who sculpted most of the statues around City Hall. The tour goes on to several rooms on the inside of City Hall, including the Mayor’s Reception Room, which includes portraits of every mayor of Philadelphia, sans Ed Rendell, Michael Nutter, and Jim Kenney. Your odds of actually seeing the mayor here are pretty slim, but who knows? Conversation Hall is also on the second floor, and that has a magnificent chandelier and a marble statue of Washington, removed from the outdoor elements. Visitors are then taken to the Caucus Room, the impressive private meeting space for city council. It includes marble columns, an imposing round table, and a spectacular ceiling mural, as well as portraits and sculptures. The public version of this is the city council chambers, which is not as impressive, but is still quite formidable. The tour concludes with the tower, which can also be visited on its own. Before the opening of Philly From the Top, it was the highest point in the city that could be accessed by the public. From here, the best views are those facing straight down the Parkway, leading up to the Art Museum. 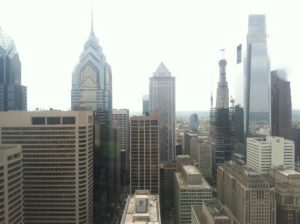 You can see up broad to Temple University, and down Broad to the Sports Complex. To the west, all of the skyscrapers of modern Philadelphia are seen, as each building to surpass City Hall is west of Broad. Other sights that can be seen from here include the Pennsylvania Convention Center, Italian Market, and Eastern State Penitentiary. The rest of Penn Square is occupied by Dilworth Park, a newly renovated park that opened in 2014. The old, run-down plaza was renovated into what stands now, which includes a cafe, a brand-new subway entrance, and during the summer, a set of fountains, which children often play in. During the winter, there’s grass and an ice rink on the spot. While subject to change, the Christmas Market has been located in City Hall’s courtyard and in Dilworth Park.